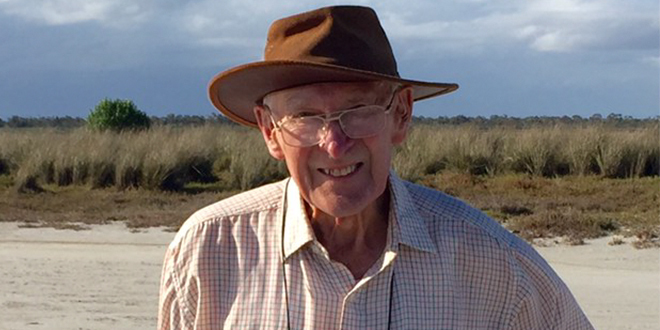 Later years: Rex Scambary at Paradise Beach, eastern Victoria, in 2015. REX Scambary, one of the legion of New Zealand journalists who made a powerful contribution to Australian media, has died in Melbourne aged 89. From 1958 to 1984, Rex worked with the Australian Information Service under its various titles. The Commonwealth’s overseas information agency provided journalists as media officers to all major Australian diplomatic posts. The genial Mr Scambary served as press officer at the Australian High Commission, London (1961-64); Information Attache, Australian High Commission, New Delhi (1968-71) and First Secretary (Information), Australian High Commission, Wellington, 1972-76. An unflappable professional, always softly spoken, he was far from the old stereotype of the outspoken, hard-living Australian journalist. Ironically, his father was Australian. Arthur Scambary, aged 12, had migrated to Wellington, New Zealand in 1902 with his widowed mother and seven siblings when drought forced the family off their northern NSW dairy farm. Born in Palmerston North on September 17, 1929 to Arthur and Mary Scambary, Rex grew up as part of a large extended family. He graduated Bachelor of Arts from Victoria University College in 1952. He considered himself lucky to have started work as the economy grew after the Second World War. His introduction to journalism was on The Southern Cross in Wellington, a daily newspaper published by the NZ Labour Party. He crossed to the Evening Post in Wellington, and then to the Straits Times in Singapore and Kuala Lumpur during the Malayan Emergency, where he got a notable scoop with a midnight secret meeting with the leading Communist insurgent, Chin Peng. He returned to Wellington in 1956 as parliamentary reporter for the NZ Press Association. His luckiest break in life, Rex always insisted, was meeting Rita Barker in the office of the Minister for Agriculture, Keith Holyoake. After a year with Australian Associated Press in Melbourne, Rex joined the Melbourne office of the Australian News and Information Bureau (later AIS, and other names), mainly writing on economic subjects, including support for the Overseas Investment Information program. Despite a gentle self-effacing nature – and quiet but well-modulated voice – he was powerful with both the spoken and written word. This innate ability and his PR skills were put to good use in the serious business of telling the world about Australia. In India, he had the enjoyable task of hosting the Australian cricket team, and less happily, having rioters burst through his backyard as they fled police during the division of Pakistan and Bangladesh. His Indian connections later saw him arrange for Indian cricket writers visiting Australia to interview Sir Donald Bradman. A brilliant and humorous raconteur, his anecdotes (often against himself) showed deep insight into human nature and human foibles. His forum was often the Monday Club dining room at Jimmy Watson’s famed Carlton wine bar, where University of Melbourne academics and his AIS colleagues dwelled on the punchline of his latest story. A popular member of the Elwood Angling Club, Rex kept a small “tinnie” for many years and his fishing skills also brought joy and a sense of worth to many others, including disabled and disadvantaged men and boys (some in wheelchairs) he often took on his fishing trips. After AIS he spent two years in Brisbane with The Catholic Leader (including support with media arrangements for the 1986 Papal visit) before returning to Melbourne to hone his golf, fishing and metal detecting for gold with his mate Leo Foley. He is survived by Rita, and children Anne, James and Ben.